I’ve been blessed to be able to do a lot of traveling this year, overseas as well as in the US. This weekend, I’m in Shenandoah, Iowa, visiting our older daughter. This morning I had a lovely (but chilly & windy) walk on the Wabash Trace, post material for tomorrow. But today is time for WordPress’s photo challenge. Last week I was very late (travels again), which means not as many views. But that’s OK. This week’s theme is “Minimalist.” I’ll work hard at getting to as many of your photos as I can. It’s always great to see what you’ve come up with and to learn for other photographers. What an uber groovy shot. Love the sunlight. I was out for a walk and the light caught my eye. I was happy to see that the photo caught what I saw. Thanks, Matt. This is my all time favorite flower! Beautiful in its simplicity. Great capture, Janet. Thanks so much. The light was just perfect so I only had to take the shot. Love the detail of the veining and the tiny hairs. Good shot, Janet. Thanks, Sandra, and a great weekend to you and Neville. Very pretty. I love Iris. I do, too! Always sad when their season is over. Wonderful! I have water lilies growing near my place and every year I take photos of them. They must be getting tired of me by now ;-). The small lake near our house had a raft of waterlilies a summer ago that were very Impressionistic, but not this year. I miss them! Be-aut-i-ful! 🙂 gorgeous light, gorgeous texture, lovely colour…. Thanks so much, Sue. Have a great weekend. Thanks, and you have a good weekend too! Your irises were beautiful, Raewyn. Many thanks! Enjoy the weekend. What a perfect light and colors! Great. Beautiful Janet! How did you get such a dark background without fading out the lovely translucent purple of the flower?! A work of art indeed! Wonderful effect! 🙂 I love the photo. Thanks! I’m glad. It’s one of my favorites and one of those being-in-the-right-place-at-the-right-time photos. The iris was at the base of a tree and the tree was keeping the light off the background but the sun was shining directly on the flower. Ooh! Love the color contrast. Thanks. I was fortunate to be there at just the perfect moment. Thanks so much, Randy. I like it a lot, but I thought last week’s was pretty good, too, although I got it in late. (https://sustainabilitea.wordpress.com/2014/11/04/weekly-photo-challenge-descent-into-fall-and-then/) What do you think? Yes, I had seen that one, and I thought it was, and wrote that it was, a “grand” shot. But I would add that these are two different categories of shots, and i would not chose, if you’re asking me, one over the other. This one I consider more of a still life, while the other captures what I, and the eye, perceives as action, even though it is frost, and a still life of sorts itself – which, for me, makes it all the more exciting. But the flower, because of all of its traits, makes it a stunning visual. Thanks for the input, Randy. I was really fortunate to catch the light just right. Enjoy your weekend. I think it’s wonderful, how much you’re getting to travel. It’s been a good year for travel, that’s for sure. Thanks so much, Perpetua. Enjoy the weekend. :-). Thanks, M.R. I do love good lighting! Reblogged this on Home Decor. I am a sucker for a beautiful flower and this is a lovely composition. Great light! I’m happy to hear you enjoyed it. The light was perfect, so I was lucky to be there at the right time. 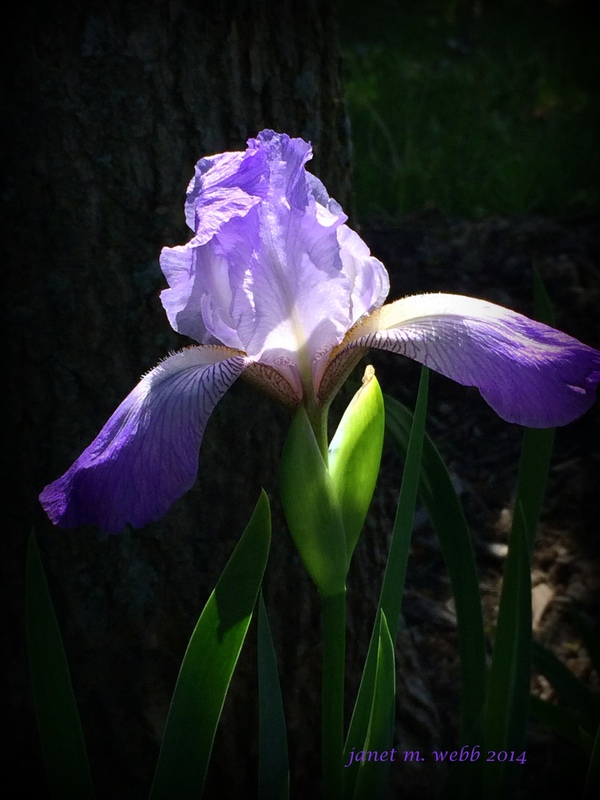 Gorgeous light – and irises are elegant. They really are elegant but don’t last as long as I would like. Great minds!! Glad you liked the photo, Izzy. Hope you’re enjoying your weekend. Janet, it is always a pleasure to see what your creativity brings out. Thanks, Chris! I really appreciate reading that. Thanks, Madhu. Haven’t seen you around so I hope it’s just me missing you and not anything else. I’ve done the same thing before. Not to worry. Just beautiful! …and the light …great shot! Thanks so much, Arl, and thanks for visiting! One word: Wow! such an awesome shot. The flower is absolutely beautiful. Gale, thanks! I was very fortunate that the photo depicted so well what I saw. You’re welcome and thanks for the return visit. Have a blessed weekend. Gorgeous image of the Iris! Thanks so much, Su. How did you get there today? Was it linked to my current submission? I’m always interested when older shots show up with new comments. But that one is one of my favorites and, I think, one of my best. Actually I was just browsing. I’m waiting for my computer to do some updates and using the time to look through others’ blogs for posts I’ve missed. I seem to have so little time to keep up with what everyone is posting.